You will be excited to find out the various choices you have when you are searching for a Panama City Beach hotel that is ideal for all occasions and budgets. Families looking for a resort style property with a kid’s club should try the Holiday Inn Resort Panama City Beach as well as the Palmetto Inn and Suites which offers two swimming pools. Mid-range all-suite choices for all types of travelers include the Legacy by The Sea and Beachbreak by The Sea. Other all-suite options are the Beachcomber by The Sea and Beach Tower by The Sea boasts full kitchens. The Beachside Resort and Bikini Beach Resort Motel boast great value for families with free breakfast. Travelers looking for simple units with amenities should stay at the Hampton Inn and Suites Panama City Beach-Beachfront or the Days Inn Panama City Beach/Ocean Front which has a waterfall pool. If you are interested in a family-friendly Panama City Beach hotel that offers plenty of amenities for children, has direct beach access and is a short distance to many attractions then you should stay at the Holiday Inn Resort Panama City Beach. 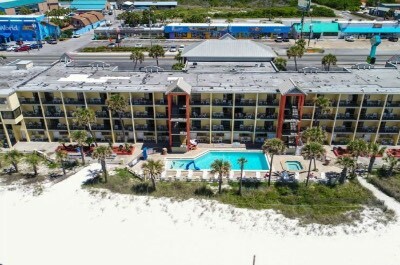 Located along Front Beach Road just north of Panama City Beach, the Holiday Inn Resort Panama City Beach is situated along the shoreline of the Gulf of Mexico on a white sand beach and is less than 1-mile to Shipwreck Island Waterpark. The Holiday Inn Resort Panama City Beach has a modern crescent shaped fifteen story architectural design with 340 rooms and suites that feature a contemporary beach interior. All rooms at the Holiday Inn Resort Panama City Beach have private balconies with a Gulf of Mexico view as well as a small kitchenette that has a microwave and refrigerator. Standard rooms have 326 square feet with two queen size beds and kid suites contain two twin beds as well as queen size bed. Family suites include more living space with two sets of bunk beds, a queen size bed and extra children friendly amenities. One-bedroom suites are available with a separate living room and two balconies. 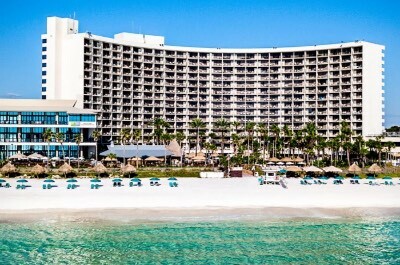 The Holiday Inn Resort Panama City Beach has a great place on the white sand beach where you will find plenty of space to relax and there are plenty of watersport opportunities available from nearby vendors. The Holiday Inn Resort Panama City Beach offers numerous activities for adults during the day as well as for children through the kid’s club and kids will be thrilled with Aqualand which features over 20 water toys including splash buckets. The property is nearby to several attractions such as Ripley’s Believe It or Not, WonderWorks and the M.B. Miller County Pier. 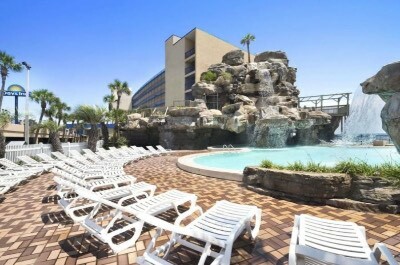 The Holiday Inn Resort Panama City Beach has a lagoon-style freshwater swimming pool with a nice sundeck as well as waterfalls, a fitness center, game room and a full service spa onsite. Dining at the property includes the View Restaurant for all three meals and there are several nearby restaurants that include the Firefly for steaks, Dee’s Hang Out prepares Cajun as well as Bayou on the Beach Cafe. Nightlife includes evening Polynesian shows onsite, live music on selected nights on the Escape Deck and you can walk to the Nivol Brewery as well as the Wicked Wheel Bar and Grill. When you are looking for a family-friendly mid-range Panama City Beach hotel that offers quick beach access, has plenty of added amenities onsite and is within a short distance to many attractions then the Palmetto Inn and Suites are perfect. Located in the Lakes at Summer Breeze area along Front Beach Road, the Palmetto Inn and Suites are situated directly on the white sand beach overlooking the Gulf of Mexico and they are within 0.5-miles to the Museum of Man in the Sea. The Palmetto Inn and Suites Panama City Beach hotel is composed of two modern two and seven floor buildings that have 122 rooms and suites that boast a contemporary beach decor. Rooms within the older north side motel building have an open floorplan with a choice of bedding and a small kitchenette (microwave and refrigerator) but no balcony. Efficiency units have a choice of bedding and a full kitchen with no balcony. Beachside rooms have 478 square feet with a choice of bedding, a small kitchenette and private balcony with Gulf of Mexico views. Efficiency units are sized similar with a choice of bedding, a full kitchen and a private balcony with gulf views. Regular queen suites have 544 square feet with a separate integrated living/kitchen area and a private balcony with gulf views. Deluxe queen suites are 843 square feet with a separate living room, larger kitchen area and an enlarged balcony with gulf views. The Palmetto Inn and Suites have a great place on the beachfront with direct access to the white sands where you will find plenty of space to relax and there are vendors with watersport equipment. The Palmetto Inn and Suites are situated within 2-miles to the Gulf World Marine Park, 5-miles away from the Shipwreck Island Waterpark and you can walk to Pier Park for shopping as well as entertainment. The Palmetto Inn and Suites has an indoor and an outdoor freshwater swimming pool with a tiki bar, two children’s pools, shuffleboard area, barbeque grills, a fitness center and an arcade room. Dining onsite includes a snack bar and you will find several eateries within walking distance that include the Boars Head Restaurant and Tavern, Eat My Pasty serves pub fare as well as Buddy’s Seafood Market. Nightlife includes a lively atmosphere at the Sandpiper Tiki Bar or you can take the family to the XD Darkride Experience Pier Park. If you are interested in a mid-range family-friendly Panama City Beach hotel that boasts perfect beach access, is within a short distance to many attractions and boasts a fitness center then the Legacy by the Sea is a fabulous selection. Located in the Gulf World area along Front Beach Road, Legacy by the Sea overlooks the Gulf of Mexico directly on the beachfront and is within 2-blocks to the Gulf World Marine Park. The Legacy by the Sea has a modern fourteen story architectural design that has 139 rooms and suites which sport a modern interior. Standard rooms have sufficient living space with a choice of bedding, a small kitchenette (microwave and refrigerator) and a private balcony with gulf views. Suites are larger with a choice of bedding, a full kitchen, separate living room and private balcony that offers Gulf of Mexico views (some king suites offer two balconies). Jacuzzi suites offer an in-suite Jacuzzi, a sitting area, small kitchenette and a view of the beachfront. 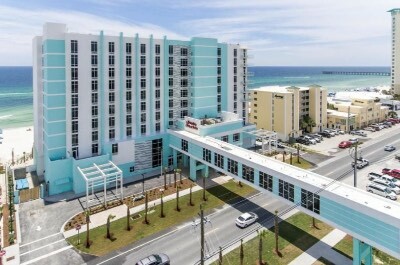 The Legacy by the Sea Panama City Beach hotel allows for great access to the white sand beach where you will find beach games and lots of room to lounge under the sun as well as drinks at the Barefoot Hide-A-Way Grill. Watersport activities are plentiful and can be arranged with nearby vendors or the hotel. The Legacy by the Sea is a perfect spot to start your adventures of the area with an easy walk to Russell Fields City Pier, the Adventure Zone at Miracle Strip and you are within 5-miles to the WonderWorks. The Legacy by the Sea has a freshwater swimming pool with a picnic area, a fitness center and a jungle gym for children. Dining onsite includes a complimentary breakfast buffet and you can find several quality restaurants within walking distance that include Diego’s Burrito Factory, Jeannie’s One Stop Diner as well as Salvatore’s Pizza and Wings. Nightlife includes a lively atmosphere at Sharky’s Beachfront Restaurant or you can take the children to a movie at the Grand 16 IMAX Theatre. When are seeking a value oriented all-suite Panama City Beach hotel that is popular with children, has perfect beach access and is within a short distance to many of the areas attractions then the Beachcomber by the Sea is superb for you. Located northwest of the Lullwater Beach area along Front Beach Road, the Beachcomber by the Sea has direct beach access along the Gulf of Mexico and is less than 1-mile to Pier Park for shopping. The Beachcomber by the Sea has a modern seven floor architectural style with 96 suites which feature a modern decor. Suites have a choice of bedding, a separate sitting area, full kitchen and a private balcony that offers views of the Gulf of Mexico. Jacuzzi suites have an open floorplan with an in-suite Jacuzzi, a sitting area, small kitchenette (microwave and refrigerator) and a private balcony with gulf views. The Beachcomber by the Sea has a perfect spot on the white sand beach where you will find everything you need for a great day under the sun. Vendors are available onsite with beach and watersport equipment rentals as well as activities on the water. 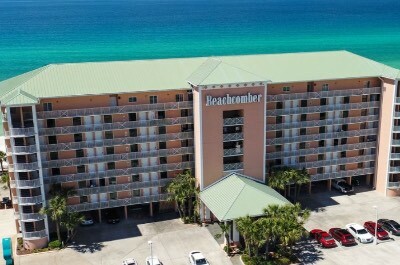 The Beachcomber by the Sea Panama City Beach hotel is within an easy walk to the Museum of Man in the Sea and within a short drive to several other attractions that include Conservation Park as well as Ripley’s Believe It or Not. The Beachcomber by the Sea has a freshwater swimming pool with a sundeck that features shuffleboard, barbeque grills, picnic tables and a small tiki bar. Dining onsite includes a complimentary breakfast buffet and you will find numerous eateries within an easy walk to the property that includes Muy Wayne O’s for Mexican dishes, Eat My Pasty prepares English pub specialties as well as Marco’s Pizza serves Italian. Nightlife includes a short walk to the Sandpiper Tiki Bar or you can take the children to Pier Park Amusements for an evening of fun. If you are interested in finding a mid-range Panama City Beach hotel that is perfect for families who want to be close to the beach as well as close to several family-friendly attractions then the Beachbreak by the Sea is a great choice. Located in the Gulf World area along Front Beach Road, the Beachbreak by the Sea is situated directly on the beachfront overlooking the Gulf of Mexico and is a quick 1-block to the Gulf World Marine Park. The Beachbreak by the Sea has a modern four story architectural design that contains 97 rooms and suites that have a renovated contemporary interior. Standard rooms have ample living space with two double beds and a small kitchenette (microwave and refrigerator) as well as views of the surrounding area. Deluxe double rooms have two double beds, an open floorplan with a sofa sleeper, separate full kitchen and a private balcony with Gulf of Mexico views. Efficiency units have a choice of bedding with an open floorplan that includes a sofa sleeper, a separate kitchen and private balcony that features views of the gulf. The Double Split suite has two rooms with bedding, an open floorplan that contains a sitting area, full kitchen and a private balcony that offers views of the beachfront. The Beachbreak by the Sea boasts an ideal spot on the white sand beach where you can relax and play beach games. Swimming and watersport activities are plentiful through nearby vendors around the beach area. The Beachbreak by the Sea Panama City Beach hotel is within a short distance to many attractions including Pier Park for shopping, Russell Fields City Pier has fishing and you are only 5-miles away from the ZooWorld Zoological Conservatory. The Beachbreak by the Sea has a freshwater swimming pool that overlooks the Gulf of Mexico with barbeque grills and picnic tables. Dining includes a complimentary breakfast onsite and there are several restaurants within walking distance including the Barefoot Hide-A-Way Bar and Grill, Moe’s Original Bar B Que as well as Pompano Joe’s for seafood. Nightlife can include a walk on the beach at sunset and you can walk to Tootsie’s Orchid Lounge for live music or take the children to WonderWorks which is just a short drive away. When you are searching for a value oriented Panama City Beach hotel that is perfect for families and has great access to a quieter beach area then the Beachside Resort is ideal. Located south in the Sunnyside area along Front Beach Road, the Beachside Resort is situated directly on the beach overlooking the Gulf of Mexico and is 6-miles away from the Gulf World Marine Park. The Beachside Resort has a modern seven floor architectural style with 147 rooms and suites which feature a renovated contemporary decor. Queen bed rooms are spacious with a small kitchenette (microwave and refrigerator) but the rooms do not offer a private balcony. Double Queen Hotel rooms have a small kitchenette and a private balcony with gulf views. Larger two room queen suites have ample living space with a small kitchenette and private balcony that sports a view of the gulf. There are also larger two room queen suites that feature a full kitchen and a private balcony with beachfront views. 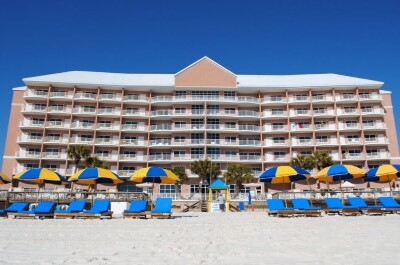 The Beachside Resort Panama City Beach hotel offers great beach access where you will find white sand with plenty of space to relax and play beach games. There are a plethora of watersport activities available from outside vendors on the beach. The Beachside Resort has a nice spot for you to begin your adventures with only 2-miles to Camp Helen State Park, 3.5-miles from Timpoochee Trail and you are 4-miles away from the Museum of Man in the Sea. 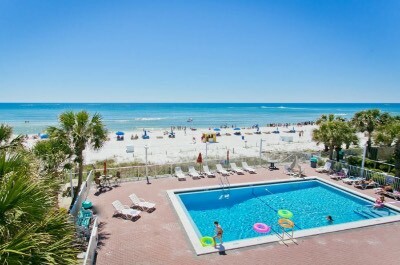 The Beachside Resort has a freshwater swimming pool that features the Reef Beach Bar and overlooks the Gulf of Mexico. There is no restaurant onsite and dining offsite within a short walk or drive includes Bayou Bill’s Crab House for seafood, the Sunnyside Grill has diner dishes as well as Edward’s Fine Food and Wine. Nightlife includes live music at the Reef Beach Bar on selected evenings, the Beach House Bar is within walking distance and you are only 4-miles to the Sandpiper Tiki Bar. If you are interested in a family-friendly Panama City Beach hotel that offers plenty of free amenities, has easy beach access and is near many attractions then you should stay at the Hampton Inn and Suites Panama City Beach-Beachfront. Located in the Gulf World area along Front Beach Road, the Hampton Inn and Suites Panama City Beach-Beachfront is situated directly on the beach with great views of the Gulf of Mexico and is 1-block from the Gulf World Marine Park. The Hampton Inn and Suites Panama City Beach-Beachfront has a modern ten story architectural design with 182 rooms and suites that feature a contemporary interior. All rooms and suites are furnished with a small kitchenette that includes a microwave and refrigerator. Rooms are spacious with a choice of bedding, floor to ceiling windows and king size bed rooms include a sofa sleeper as well as a balcony that boasts a gulf view. Studio suites have two queen size beds, floor to ceiling windows, a sofa sleeper in the sitting area and a private balcony that sports a city or gulf view. The Hampton Inn and Suites Panama City Beach-Beachfront has a great spot on the white sand beach where you will find lots of space to lounge as well as play beach games and there are plenty of watersport activities available from nearby vendors. The Hampton Inn and Suites Panama City Beach-Beachfront is nearby to many outstanding attractions such as Pier Park for shopping, the Russell Fields City Pier has fishing and you are 4-miles away from Conservation Park where you will find nature trails. The property has a freshwater swimming pool with a sundeck that has barbeque grills and there is a fitness center onsite. Dining includes a complimentary breakfast and there are plenty of offsite eateries within an easy walk that includes Diego’s Burrito Factory, Shuckums Oyster Pub and Grill for seafood as well as Moe’s Original Bar B Que. Nightlife can include a short walk to Sharky’s Beachfront Restaurant and Tootsie’s Orchid Lounge for live music or you can watch a movie at the Grand 16 IMAX Theatre. 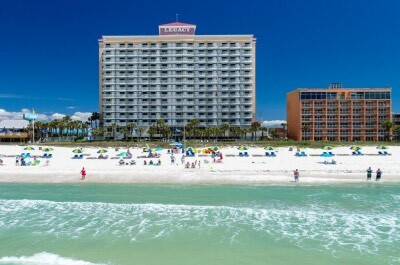 When you are seeking a comfortable value oriented Panama City Beach hotel that offers excellent beach access, is nearby to numerous family attractions and is perfect for all types of travelers then the Beach Tower by the Sea is superb. 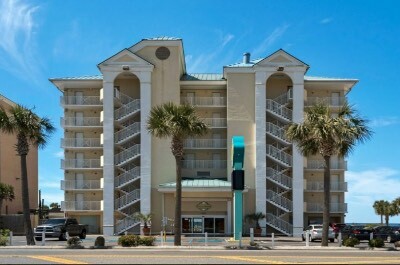 Located along Front Beach Road directly on the beach overlooking the Gulf of Mexico, the Beach Tower by The Sea is situated less than 3-miles away from the Gulf World Marine Park and you are 7-miles to St. Andrews State Park. The Beach Tower by The Sea has a modern six floor architectural style with 48 rooms that sport a minimalist modern decor. All rooms have a private balcony that overlooks the Gulf of Mexico. Rooms are spacious with a choice of bedding and you have a choice of a full kitchen or a small kitchenette (refrigerator and microwave). 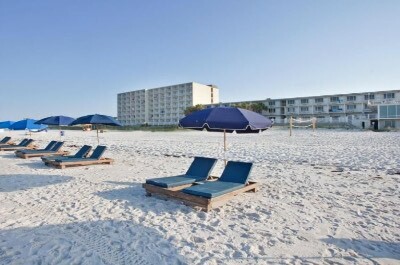 The Beach Tower by The Sea has a nice stretch of private beach front where you will find beach chairs and umbrellas. Watersport activities can be arranged next door through a vendor and the swimming is good. The Beach Tower by The Sea is a nice place to begin your adventures of the area where you will find within 3-miles from the property ZooWorld Zoological Conservatory as well as Ripley’s Believe It or Not and you are 2-blocks from fishing at the M.B. Miller County Pier. The Beach Tower by The Sea Panama City Beach hotel has a freshwater swimming pool that has a sundeck which overlooks the Gulf of Mexico and there is the World’s Smallest Beach Bar for drink service. There is not a fitness center or spa onsite. Dining includes a complimentary breakfast and there is a plethora of dining options offsite within walking distance such as Bayou on the Beach Cafe for Cajun, Harpoon Harry’s prepares seafood and the Firefly serves steaks. Nightlife includes a walk to Sweet Dreams Karaoke Bar, the Wicked Wheel Bar and Grill or you can take a short drive to Tootsie’s Orchid Lounge. When you are looking for a Panama City Beach hotel that boasts perfect beach access, is within a short distance to many family attractions and is ideal for all types of travelers then the Bikini Beach Resort Motel is superb. Located along Front Beach Road just north of Panama City Beach, the Bikini Beach Resort Motel has a great spot on the beach overlooking the Gulf of Mexico and is within 1-mile to the family attraction WonderWorks. The Bikini Beach Resort Motel has a modern Colonial five story architectural design with 86 rooms and suites that sports a modern beach interior. Inland view rooms are spacious with a choice of bedding, a choice of full kitchen or small kitchenette (microwave and refrigerator). Beach front rooms have a queen size bed, small kitchenette and a private balcony with views of the Gulf of Mexico. Deluxe Double rooms have two double beds, a full kitchen and a private balcony with views of the ocean. Three Double Bed suites have two-bedrooms with three double beds, a full kitchen and a glass enclosed balcony that has a view of the beachfront. The Bikini Beach Resort Motel has a nice spot on the beach where you can lounge, swim as well as enjoy a variety of watersport adventures and there is beach equipment available for rent. The Bikini Beach Resort Motel Panama City Beach hotel is an excellent place to start your adventures with many attractions within a short distance that includes the M.B. Miller County Pier, the Shipwreck Island Waterpark and St. Andrews State Park is 6-miles from the property. The Bikini Beach Resort Motel has a nice freshwater swimming pool which has a sundeck with barbeque grills that overlooks the Gulf of Mexico. There is no restaurant onsite but there is plenty of dining options within walking distance that includes Dee’s Hang Out for Cajun dishes, Saltwater Grill prepares seafood and Dolce 101 serves Italian specialties. Nightlife within an easy walk includes a craft beer at Nivol Brewery or you can try Rockit Lanes for family and arcade style fun. If you are searching for a value oriented Panama City Beach hotel that is perfect for families with a great swimming pool and easy access to the beach then you should try the Days Inn Panama City Beach/Ocean Front. Located along Front Beach Road just south of downtown Panama City, the Days Inn Panama City Beach/Ocean Front is situated directly on the beach overlooking the Gulf of Mexico and is 2-miles away from Gulf World Marine Park. The Days Inn Panama City Beach/Ocean Front has a modern seven floor architectural style with 188 rooms that feature a simplistic modern decor. All rooms and suites have a private balcony with a view of the beach front and Gulf of Mexico. Standard rooms have two queen size beds and a small kitchenette (microwave and refrigerator). Efficiency units have a separate kitchen area with a full kitchen including a stove top and two queen size beds. Family rooms are slightly larger with two separate sleeping areas that have three queen beds and there is a small kitchenette. The Days Inn Panama City Beach/Ocean Front has a perfect spot on the beach with plenty of room to relax on the sand and swimming is good. There is a plethora of water sports activities available from local vendors and you can enjoy complimentary yoga lessons daily. The Days Inn Panama City Beach Hotel/Ocean Front is within walking distance to many family attractions such as Shipwreck Island Waterpark and you are within 3-miles to the ZooWorld Zoological Conservatory as well as Ripley’s Believe It or Not. The Days Inn Panama City Beach/Ocean Front has a great freshwater swimming pool that features a six story waterfall and barbeque grill area as well as bar service. Dining at the Days Inn Panama City Beach/Ocean Front includes a complimentary breakfast and you will find numerous eateries within a short distance such as the Shrimp Basket, Nick’s Slice of Brooklyn Pizzeria and Bar as well as Firefly for steaks. Nightlife nearby includes an easy walk to Sweet Dreams Karaoke Bar as well as the Buoy Bar or take the family to WonderWorks for fun as well as games.